Defeating Karate kicks first involves knowing how the karate kicks are performed and used and understanding both the strengths and weaknesses inherent to the techniques. Of course in our Phase I class we are referring to average basic common karate kicks practiced in most Karate schools in America today. 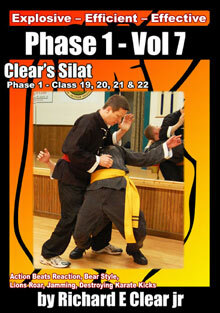 Defeating these kicks is one of the basic Phase I classes in the Clear’s Kun Tao Silat curriculum and of course there is much more advanced material further along in our curriculum as we definitely understand that a senior black belt in a good karate system will have more than just the basics to work with and will move much better and with more fluidity and less telegraphing than most folks who practice and train these kicks. Each of these kicks have their strengths and defeating them means avoiding those and taking advantages of the weaknesses of the kicks as practiced by most people. 1. They are usually thrown above the waist which means because of the travel distance that they normally take to long from the time they are thrown until they actually land. For instance a front snap kick thrown to the head will normally take about 3 times longer to arrive than a front snap kick thrown at the knee. 2. The kicks are normally telegraphed and with a little practice (to develop a trained eye) they can be seen way before they are actually thrown. There are two basic aspects to the basic telegraph. a. The back leg is used to throw the kick and the cocking and getting ready to throw the kick is obvious to a trained eye. b. The body of the kicker tends to turn or shift in preparation to throw the kick and again the signals can easily be picked up by someone who has trained to see it. 3. As a result of 1, 2a and 2b a practitioner who is ready with a knee high kick that is simply lifted and pushing can kick and pick off the kickers stable leg as soon as the kicker starts to launch a kick. The knee kick normally lands first and with enough force that the karate type kick is usually completely stopped in place. 4. Most Karate students train to throw kicks from a stationary stopping or very slow pace of movement at the actual time of the execution of a kick. 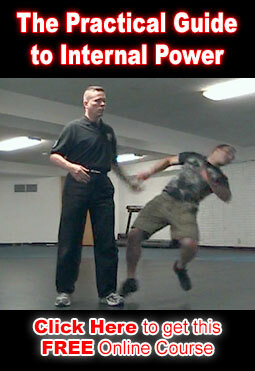 As a result another simple strategy to easily defeat karate type kicks is to simple get moving and stay mobile no matter what the kicker tries to do to get you to stay in place. This will easily defeat the majority of even skilled karate type kickers kicks. It sounds to simple but I did not come to this conclusion overnight and this has been tested over and over again by students and practitioners and in the last twenty years has been proven (sometimes quite drastically) in the UFC – MMA type fights.